Text: When Act of Authority enters the battlefield, you may exile target artifact or enchantment. Text: Reveal the top four cards of your library. You may put a creature card from among them onto the battlefield. It gains "At the beginning of your end step, return this creature to its owner's hand." Then put the rest of the cards revealed this way on the bottom of your library in any order. Text: Akoum Refuge enters the battlefield tapped. Text: Arcane Sanctum enters the battlefield tapped. Text: Put thirteen 2/2 black Zombie creature tokens onto the battlefield tapped. Text: When Augur of Bolas enters the battlefield, look at the top three cards of your library. You may reveal an instant or sorcery card from among them and put it into your hand. Put the rest on the bottom of your library in any order. Text: Whenever Augury Adept deals combat damage to a player, reveal the top card of your library and put that card into your hand. You gain life equal to its converted mana cost. Text: When Avenger of Zendikar enters the battlefield, put a 0/1 green Plant creature token onto the battlefield for each land you control. Text: Tap an untapped Wizard you control: Draw a card. Text: Azorius Chancery enters the battlefield tapped. Text: Azorius Guildgate enters the battlefield tapped. Text: Azorius Herald can't be blocked. Text: At the beginning of each upkeep, you draw a card and you lose 1 life. Text: Landfall — Whenever a land enters the battlefield under your control, Baloth Woodcrasher gets +4/+4 and gains trample until end of turn. Text: When Bane of Progress enters the battlefield, destroy all artifacts and enchantments. Put a +1/+1 counter on Bane of Progress for each permanent destroyed this way. Text: Equipped creature gets +2/+2 and has lifelink and trample. Text: , Sacrifice a creature: Blood Rites deals 2 damage to target creature or player. Text: Target player draws X cards. Shuffle Blue Sun's Zenith into its owner's library. Text: Choose one — Boros Charm deals 4 damage to target player; or permanents you control gain indestructible until end of turn; or target creature gains double strike until end of turn. Text: Boros Garrison enters the battlefield tapped. Text: Draw a card for each tapped creature target opponent controls. Text: At the beginning of each end step, each player gains control of all nontoken permanents he or she owns. Text: , Sacrifice a creature: Draw a card. Text: At the beginning of your upkeep, return an instant or sorcery card at random from your graveyard to your hand. Text: Whenever you gain life, you may pay . If you do, put a +1/+1 counter on target creature for each 1 life you gained. Text: No more than two creatures can attack you each combat. Text: Choose one — Return target permanent to its owner's hand; or destroy target nonblack creature, and it can't be regenerated; or destroy target artifact. Text: Target opponent sacrifices a creature, discards three cards, then loses 5 life. You return a creature card from your graveyard to your hand, draw three cards, then gain 5 life. Text: Crumbling Necropolis enters the battlefield tapped. Text: Search your library for up to two basic land cards, reveal those cards, and put one onto the battlefield tapped and the other into your hand. Then shuffle your library. Whenever a player attacks enchanted player with one or more creatures, that attacking player may discard a card. If the player does, he or she draws a card. Whenever a player attacks enchanted player with one or more creatures, that attacking player may tap or untap target permanent of his or her choice. Whenever a player attacks enchanted player with one or more creatures, that attacking player may put a 2/2 black Zombie creature token onto the battlefield tapped. Enchanted creature is a 0/1 Insect artifact creature with indestructible and loses all other abilities, card types, and creature types. Text: Death Grasp deals X damage to target creature or player. You gain X life. Text: Whenever another creature dies, you may put a +1/+1 counter on Deathbringer Thoctar. When Deceiver Exarch enters the battlefield, choose one — Untap target permanent you control; or tap target permanent an opponent controls. Text: Destroy all creatures. They can't be regenerated. Draw a card for each creature destroyed this way. Text: , Sacrifice a creature: You gain life equal to the sacrificed creature's toughness. Text: Whenever Diviner Spirit deals combat damage to a player, you and that player each draw that many cards. Text: Choose one — You gain 5 life; or counter target spell; or target creature gets -2/-2 until end of turn. Text: , : Reveal the top card of your library. If it's a creature card, put a 1/1 green Saproling creature token onto the battlefield. If it's a land card, put that card onto the battlefield under your control. If it's a noncreature, nonland card, you gain 2 life. Text: At the beginning of your end step, if you control a creature with power 5 or greater, you may draw a card. Text: When Endless Cockroaches dies, return it to its owner's hand. Text: Whenever you cast a creature spell, put X 1/1 black Thrull creature tokens onto the battlefield, where X is that spell's converted mana cost. Text: When Eye of Doom enters the battlefield, each player chooses a nonland permanent and puts a doom counter on it. Text: Faerie Conclave enters the battlefield tapped. Text: Famine deals 3 damage to each creature and each player. Text: Whenever a creature dies, that creature's controller may draw a card. Text: Whenever Fell Shepherd deals combat damage to a player, you may return to your hand all creature cards that were put into your graveyard from the battlefield this turn. Text: When Fiend Hunter enters the battlefield, you may exile another target creature. Text: Choose one or both — Destroy target artifact; and/or destroy target nonbasic land. Text: Whenever a creature you control dies, you may pay . If you do, reveal cards from the top of your library until you reveal a creature card. Put that card into your hand and the rest into your graveyard. Text: Destroy all nonbasic lands. For each land destroyed this way, its controller may search his or her library for a basic land card and put it onto the battlefield. Then each player who searched his or her library this way shuffles it. Text: Whenever you sacrifice another permanent, you may pay . If you do, Furnace Celebration deals 2 damage to target creature or player. Text: Whenever a creature attacks one of your opponents or a planeswalker an opponent controls, that creature gets +2/+0 until end of turn. Text: Sacrifice a creature: Goblin Bombardment deals 1 damage to target creature or player. Text: Goblin Sharpshooter doesn't untap during your untap step. : Goblin Sharpshooter deals 1 damage to target creature or player. Text: Golgari Guildgate enters the battlefield tapped. Text: , Sacrifice a creature: Return target creature card from your graveyard to your hand. Text: Landfall — Whenever a land enters the battlefield under your control, you may gain 2 life. Text: Choose one — Return target permanent to its owner's hand; or target creature gets -4/-4 until end of turn; or creatures you control get +2/+0 until end of turn. Text: Whenever you cast an instant or sorcery spell, Guttersnipe deals 2 damage to each opponent. : Each player gains control of all creatures he or she owns. Text: Hooded Horror can't be blocked if defending player controls the most creatures or is tied for the most. Text: : Put target creature card from your graveyard on top of your library. Activate this ability only during your turn, before attackers are declared. Text: Choose one — Destroy target artifact; or destroy target enchantment; or destroy target artifact and target enchantment. Text: When Hunted Troll enters the battlefield, target opponent puts four 1/1 blue Faerie creature tokens with flying onto the battlefield. Text: Cast Illusionist's Gambit only during the declare blockers step on an opponent's turn. Remove all attacking creatures from combat and untap them. After this phase, there is an additional combat phase. Each of those creatures attacks that combat if able. They can't attack you or a planeswalker you control that combat. Text: Choose two — Incendiary Command deals 4 damage to target player; or Incendiary Command deals 2 damage to each creature; or destroy target nonbasic land; or each player discards all the cards in his or her hand, then draws that many cards. Text: : Inferno Titan gets +1/+0 until end of turn. Whenever Inferno Titan enters the battlefield or attacks, it deals 3 damage divided as you choose among one, two, or three target creatures and/or players. Text: All creatures get -2/-2 until end of turn. Text: Izzet Guildgate enters the battlefield tapped. Text: , : Each player discards his or her hand, then draws cards equal to the greatest number of cards a player discarded this way. Text: : Put a 1/1 green Saproling creature token onto the battlefield. Text: Whenever a creature you control dies, put two eyeball counters on Jar of Eyeballs. , , Remove all eyeball counters from Jar of Eyeballs: Look at the top X cards of your library, where X is the number of eyeball counters removed this way. Put one of them into your hand and the rest on the bottom of your library in any order. Text: Choose one — Exile all cards from target player's graveyard; or Jund Charm deals 2 damage to each creature; or put two +1/+1 counters on target creature. , , Sacrifice Jund Panorama: Search your library for a basic Swamp, Mountain, or Forest card and put it onto the battlefield tapped. Then shuffle your library. Text: Jungle Shrine enters the battlefield tapped. Text: Jwar Isle Refuge enters the battlefield tapped. Text: Kazandu Refuge enters the battlefield tapped. : Put a 3/3 green Elephant creature token onto the battlefield. : Put two 3/3 green Elephant creature tokens onto the battlefield. Text: Khalni Garden enters the battlefield tapped. When Khalni Garden enters the battlefield, put a 0/1 green Plant creature token onto the battlefield. , : Put a 0/1 red Kobold creature token named Kobolds of Kher Keep onto the battlefield. Threshold — If seven or more cards are in your graveyard, instead destroy all creatures, then put two 1/1 white Spirit creature tokens with flying onto the battlefield. Creatures destroyed this way can't be regenerated. Text: Other creatures you control get +1/+1. When you cycle Krosan Tusker, you may search your library for a basic land card, reveal that card, put it into your hand, then shuffle your library. Text: Beast spells you cast cost less to cast. Enchanted land has " , : Put a 2/2 green and blue Drake creature token with flying onto the battlefield." Text: Look at the top five cards of your library. As many times as you choose, you may pay 1 life, put those cards on the bottom of your library in any order, then look at the top five cards of your library. Then shuffle your library and put the last cards you looked at this way on top of it in any order. Text: Llanowar Reborn enters the battlefield tapped. Whenever Lu Xun, Scholar General deals damage to an opponent, you may draw a card. Text: Marath, Will of the Wild enters the battlefield with a number of +1/+1 counters on it equal to the amount of mana spent to cast it. , Remove X +1/+1 counters from Marath: Choose one — Put X +1/+1 counters on target creature; or Marath deals X damage to target creature or player; or put an X/X green Elemental creature token onto the battlefield. X can't be 0. Text: For each opponent, gain control of up to one target creature that player controls until end of turn. Untap those creatures. They gain haste until end of turn. Text: , : Look at the top five cards of your library. You may put a creature card with power 5 or greater from among them onto the battlefield. Put the rest on the bottom of your library in any order. Text: Whenever you cast an instant or sorcery spell, you may pay . If you do, copy that spell. You may choose new targets for the copy. Text: : Exile target creature. Return that card to the battlefield under its owner's control at the beginning of the next end step. Text: When Mystic Barrier enters the battlefield or at the beginning of your upkeep, choose left or right. Each player may attack only the opponent seated nearest him or her in the last chosen direction and planeswalkers controlled by that player. Text: Choose one — Naya Charm deals 3 damage to target creature; or return target card from a graveyard to its owner's hand; or tap all creatures target player controls. , , Sacrifice Naya Panorama: Search your library for a basic Mountain, Forest, or Plains card and put it onto the battlefield tapped. Then shuffle your library. When you cast Naya Soulbeast, each player reveals the top card of his or her library. Naya Soulbeast enters the battlefield with X +1/+1 counters on it, where X is the total converted mana cost of all cards revealed this way. Text: At the beginning of each player's draw step, that player draws an additional card. Text: New Benalia enters the battlefield tapped. Text: , Exile two creature cards from a single graveyard: Put a 1/1 green Saproling creature token onto the battlefield. Text: Blue spells and red spells you cast cost less to cast. Text: , Sacrifice Nihil Spellbomb: Exile all cards from target player's graveyard. Text: : Add , , or to your mana pool. Text: At the beginning of your upkeep, you gain 2 life. Text: Choose one — Put a 5/5 green Beast creature token onto the battlefield; or put five 1/1 green Insect creature tokens onto the battlefield. , : Add to your mana pool one mana of any color in your commander's color identity. If you spend this mana to cast your commander, it enters the battlefield with a number of additional +1/+1 counters on it equal to the number of times it's been cast from the command zone this game. Text: At the beginning of each upkeep, if you control no Snakes, put a 1/1 black Snake creature token with deathtouch onto the battlefield. Text: Target player draws four cards. Text: Choose left or right. Starting with you and proceeding in the chosen direction, each player chooses a creature controlled by the next player in that direction. Each player gains control of the creature he or she chose. Text: Orzhov Basilica enters the battlefield tapped. Text: When Phyrexian Delver enters the battlefield, return target creature card from your graveyard to the battlefield. You lose life equal to that card's converted mana cost. Text: , Pay 2 life: Return target creature card from your graveyard to your hand. Text: At the beginning of your upkeep, put a plague counter on Plague Boiler. Text: Players have no maximum hand size. At the beginning of each opponent's upkeep, Price of Knowledge deals damage to that player equal to the number of cards in that player's hand. Text: If one or more tokens would be put onto the battlefield, twice that many of those tokens are put onto the battlefield instead. Text: Creatures can't attack you unless their controller pays for each creature he or she controls that's attacking you. When you cast Prossh, Skyraider of Kher, put X 0/1 red Kobold creature tokens named Kobolds of Kher Keep onto the battlefield, where X is the amount of mana spent to cast Prossh. Sacrifice another creature: Prossh gets +1/+0 until end of turn. Text: , , Sacrifice a creature: Destroy target enchantment. Text: Rakdos Carnarium enters the battlefield tapped. Text: Rakdos Guildgate enters the battlefield tapped. Text: : Target creature with power 5 or greater gains first strike until end of turn. When Raven Familiar enters the battlefield, look at the top three cards of your library. Put one of them into your hand and the rest on the bottom of your library in any order. Text: Sacrifice a Beast: You gain 4 life. Text: Choose target creature. When that creature dies this turn, return a creature card from its owner's graveyard to the battlefield under the control of that creature's owner. Text: Put target land card from a graveyard onto the battlefield under your control. Text: Rough deals 2 damage to each creature without flying. : Gain control of target creature for as long as you control Rubinia and Rubinia remains tapped. Text: Rupture Spire enters the battlefield tapped. Text: Savage Lands enters the battlefield tapped. Text: Savage Twister deals X damage to each creature. Text: Sacrifice a creature: Put a +1/+1 counter on Scarland Thrinax. Text: Seaside Citadel enters the battlefield tapped. Text: Sejiri Refuge enters the battlefield tapped. Text: Whenever another nontoken creature you control dies, put a 3/1 black and red Graveborn creature token with haste onto the battlefield. Text: Choose one — Target creature gets +2/+2 and gains trample until end of turn; or exile target creature with power 5 or greater; or put a 2/2 white Knight creature token with vigilance onto the battlefield. Text: Selesnya Guildgate enters the battlefield tapped. Text: Whenever Serene Master blocks, exchange its power and the power of target creature it's blocking until end of combat. Whenever an artifact creature you control deals combat damage to a player, you may put a 1/1 blue Thopter artifact creature token with flying onto the battlefield. Text: , Sacrifice a creature: Each other player sacrifices a creature. Text: Slice and Dice deals 4 damage to each creature. Text: Choose one or both — Counter target creature spell; and/or return target creature card from your graveyard to your hand. Enchanted land has " : Put a 5/5 green Beast creature token with trample onto the battlefield." Text: Spellbreaker Behemoth can't be countered. Creature spells you control with power 5 or greater can't be countered. Text: Cast Spinal Embrace only during combat. Untap target creature you don't control and gain control of it. It gains haste until end of turn. At the beginning of the next end step, sacrifice it. If you do, you gain life equal to its toughness. Whenever a player draws a card, Spiteful Visions deals 1 damage to that player. Text: Search your library for a Plains, Island, Swamp, Mountain, or Forest card and put that card onto the battlefield. Then shuffle your library. , : Put a 0/1 white Goat creature token onto the battlefield. Text: When Sprouting Thrinax dies, put three 1/1 green Saproling creature tokens onto the battlefield. Text: Search your library for a basic land card, reveal that card, and put it into your hand. Then shuffle your library. When Stormscape Battlemage enters the battlefield, if it was kicked with its kicker, you gain 3 life. When Stormscape Battlemage enters the battlefield, if it was kicked with its kicker, destroy target nonblack creature. That creature can't be regenerated. Text: Look at the top three cards of your library. Put one of them into your hand and the rest into your graveyard. Text: , Sacrifice a creature: Destroy target nonblack creature. Text: Choose a color. Sudden Demise deals X damage to each creature of the chosen color. Text: Whenever you're dealt damage, put that many charge counters on Sun Droplet. Text: , Exile Surveyor's Scope: Search your library for up to X basic land cards, where X is the number of players who control at least two more lands than you. Put those cards onto the battlefield, then shuffle your library. Text: You gain 2 life. Then if you have more life than an opponent, draw a card. Text: As long as equipped creature is tapped, tapped creatures you control get +2/+0. As long as equipped creature is untapped, untapped creatures you control get +0/+2. : You may tap or untap equipped creature. Text: : Target noncreature artifact becomes an artifact creature with power and toughness each equal to its converted mana cost until end of turn. Text: : Each player draws a card. Text: Tempting offer — Search your library for a land card and put it onto the battlefield. Each opponent may search his or her library for a land card and put it onto the battlefield. For each opponent who searches a library this way, search your library for a land card and put it onto the battlefield. Then each player who searched a library this way shuffles it. Text: Tempting offer — Put a +1/+1 counter on each creature you control. Each opponent may put a +1/+1 counter on each creature he or she controls. For each opponent who does, put a +1/+1 counter on each creature you control. Text: Tempting offer — Return a creature card from your graveyard to the battlefield. Each opponent may return a creature card from his or her graveyard to the battlefield. For each player who does, return a creature card from your graveyard to the battlefield. Text: Tempting offer — Choose target creature you control. Put a token onto the battlefield that's a copy of that creature. Each opponent may put a token onto the battlefield that's a copy of that creature. For each opponent who does, put a token onto the battlefield that's a copy of that creature. Text: Tempting offer — Put X 1/1 red Elemental creature tokens with haste onto the battlefield. Each opponent may put X 1/1 red Elemental creature tokens with haste onto the battlefield. For each player who does, put X 1/1 red Elemental creature tokens with haste onto the battlefield. Text: Whenever Terra Ravager attacks, it gets +X/+0 until end of turn, where X is the number of lands defending player controls. Text: , Sacrifice a nontoken artifact: Put a 1/1 blue Thopter artifact creature token with flying onto the battlefield. You gain 1 life. 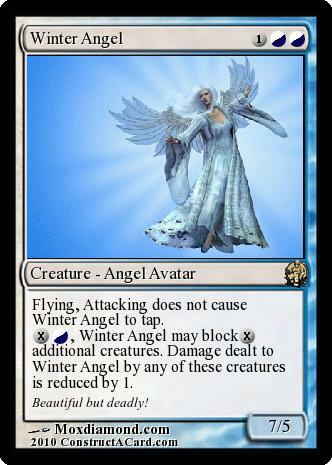 : Thornwind Faeries deals 1 damage to target creature or player. Text: You may activate abilities of creatures you control as though those creatures had haste. Text: As long as Thunderstaff is untapped, if a creature would deal combat damage to you, prevent 1 of that damage. Text: At the beginning of each upkeep, you may tap or untap target permanent. Text: Sacrifice two creatures: Put a 3/1 red Beast creature token named Carnivore onto the battlefield. Text: , : Draw four cards. Text: As an additional cost to cast Toxic Deluge, pay X life. Text: Transguild Promenade enters the battlefield tapped. Text: As True-Name Nemesis enters the battlefield, choose a player. Text: Tumble deals 6 damage to each creature with flying. Text: Put target nonland permanent into its owner's library just beneath the top X cards of that library. , : Put a 2/2 colorless Assembly-Worker artifact creature token onto the battlefield. , Return two lands you control to their owner's hand: Copy target instant or sorcery spell. You may choose new targets for the copy. Text: At the beginning of your upkeep, you may put a verse counter on Vile Requiem. , Sacrifice Vile Requiem: Destroy up to X target nonblack creatures, where X is the number of verse counters on Vile Requiem. They can't be regenerated. Text: Vivid Crag enters the battlefield tapped with two charge counters on it. Text: Vivid Creek enters the battlefield tapped with two charge counters on it. Text: Vivid Grove enters the battlefield tapped with two charge counters on it. Text: Vivid Marsh enters the battlefield tapped with two charge counters on it. Text: When Walker of the Grove leaves the battlefield, put a 4/4 green Elemental creature token onto the battlefield. Text: : This turn, creatures can't block unless their controller pays for each blocking creature he or she controls. Text: Whenever a creature enters the battlefield under your control, it deals damage equal to its power to target creature or player. Text: Return all permanents of the color of your choice to their owners' hands. Text: Whenever you gain life, you may pay , where X is less than or equal to the amount of life you gained. If you do, draw X cards. Text: Whenever a creature with power 5 or greater enters the battlefield under your control, you may have Where Ancients Tread deal 5 damage to target creature or player. Text: Whenever a spell or ability causes its controller to shuffle his or her library, that player puts a card from his or her hand on top of his or her library. Text: Players can't gain life. At the beginning of your upkeep, Witch Hunt deals 4 damage to you. At the beginning of your end step, target opponent chosen at random gains control of Witch Hunt.